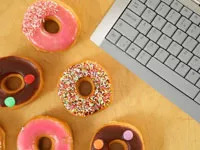 A few years ago, I worked in a 9-5 desk job in an office where the kitchen was a ever-present buffet of donuts, muffins, cookies, and other larger-than-life pastries. I honestly can't remember too many days when there wasn't some sort of sweet treat tempting me to eat it. I often fell victim to those goodies when my stress levels rose, and instead of dealing with what was actually stressing me out, I temporarily masked my feelings with the treats. For a long time, I didn't recognize this pattern was happening—until it led me to gain several pounds. Know your triggers. When I felt overwhelmed by a monstrous to-do list or frustrated by a difficult project, I'd often find myself turning to sugary treats for comfort, but learning my motives was key for controlling those cravings. Once I was more conscious of these triggers, I started to change my eating patterns. Ask, 'I am really hungry?' When I feel the urge to stress-eat, I take a moment to assess my actual hunger. I'll even ask myself: "Am I really hungry?" I know my physical and emotional hungers are different, so I try to wait out a craving to see if my hunger subsides. Stock up on healthy eats. If I am really hungry, I will eat a healthy snack, like a peanut butter and banana sandwich or Greek yogurt with cereal and nuts mixed in. The combination of healthy carbs, fat, and protein satisfies my hunger while helping me feel more relaxed at the same time. Similarly, snacking on crunchy raw veggies like carrot or celery sticks helps me deal with my frustration without consuming a lot of calories. Use distractions. When my urge to reach for a sugar treat is really strong, I distract myself from the idea. I'll either take a brisk 10-minute walk, listen to music on my iPod, read one of my favorite blogs, or chat with a friend for a little while. Most of the time, doing one of these things calms me and helps me get a handle on my stress eating. Pretend it doesn't exist. Think: out of sight, out of mind. For example, if I know there are cookies in my kitchen, I'll inevitably want to eat them as soon as I start to feel stressed. If I forget that they exist, the chances that I will turn to them for comfort drops considerably. Be healthy. This one might seem kind of obvious, but simply trying to be healthy in my everyday life helps me manage my stress levels and cravings. I try to exercise regularly and get adequate sleep each night, because I know if I'm tired or cranky, I'll reach for food as soon as I start to feel stressed.